Massey Ferguson is proud to announce it is further expanding its full-line with a host of innovative harvesting equipment at Agritechnica 17, including the launch of the MF highest density large square baler, new vertical folding mowers and a 14m wide rake. “All the equipment joining our current harvesting line-up will join a completely refreshed product portfolio for Massey Ferguson at this year’s Agritechnica Exhibition, covering all our customer segments,” says Campbell Scott. Director, Marketing Services Massey Ferguson Europe and Middle East. “These latest introductions are the result of significant and continuous investment in research and development. 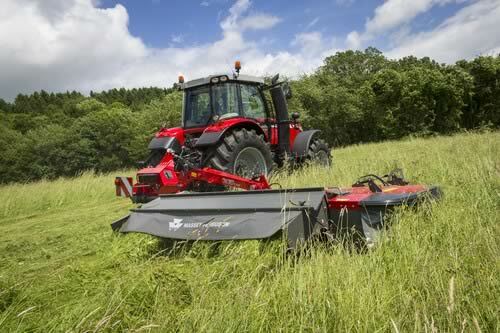 “As well as attracting new customers, the new MF UHD Baler and Hay and Forage equipment enable existing Massey Ferguson customers to combine the many attributes of their tractors with a fully compatible harvesting implement, controlled via state-of-the-art technology. The state of the art MF 2370 Ultra High Density Baler is the highest performing large square baler ever produced at the world-renowned Hesston factory. It makes Ultra Density bales weighing 20% more than the current MF 2270XD and introduces ground-breaking designs in all areas. 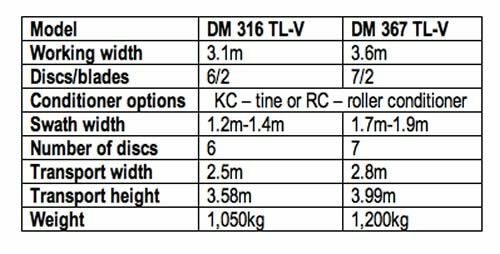 Two vertical folding disc mowers in the new MF DM TL-V Series provide working widths of 3.1m and 3.6m with a choice of two conditioner options. At 14m, the new flagship MF RK 1404 TRC-PRO rake is engineered to enable large-scale operators and contractors to create well-formed swaths ahead of high output forage harvesters and large square balers. Introducing state-of-the-art engineering in all areas, the MF 2370 Ultra HD is in a class of its own, producing 20% heavier bales. It delivers market-leading density, capacity and performance. Packing up to 20% more material into the increasingly popular 120cm x 90cm bale size boosts all-round efficiency. Fields are cleared faster with less handling, which protects the sward and soil, with the dense bales maximising truck payloads to cut transport and storage costs. Developed specifically for discerning professional contractors and large-scale arable operators, the MF 2370 Ultra HD baler delivers the density, weight and consistency demanded by the fast-growing bio-energy sector and other industrial operations. Constructed on a completely new main frame, the baler has an exclusive driveline and gearbox, specifically developed to withstand the enormous forces required to make Ultra high density bales, with a faster plunger speed and immensely strong bale forming area. The baler’s new Ultra Knotters follow the same legendarily reliable Hesston design, now optimised to efficiently handle thicker, stronger twine, developed exclusively to tie the Ultra high density bales. Sleek bodywork combines ultra-modern style with practicality. Made from the most modern composite materials, the easy to open panels provide superb access for servicing. Two new mounted vertically folding disc mowers in the MF DM TL-V Series offer even more choice in the Massey Ferguson range of high quality and dependable hay and forage equipment. All mowers are offered with the option of either the KC tine or RC roller conditioner units. The new disc mowers fold vertically behind the tractor for safe and convenient transport. Vertical folding provides a considerable reduction in overall transport length and helps improve the weight distribution, keeping the centre of gravity close to the machine. A hydraulically-folding outer panel keeps overall transport height on all models to less than 4.0m and all fold to within a 3.0m width. Optional equipment includes a parking stand that enables the mower to be stored in the vertical position to save storage space. The two models provide extra cutting width, with a choice of 3.1m and 3.6m working widths and all are equipped with the well-proven TurboLift system and a central pivot, which pulls the mover from a middle of the bed. This also helps with ground following, with the pivot allowing the machine to oscillate up 28° and down 22° on an integral hydraulic damping system. TurboLift, well proven on other Massey Ferguson mowers, allows the MF DM TL-V Series to glide over the ground, helping to protect the sward, while preventing soil contamination in the swath. The mower is protected from damage by the SafetySwing system that allows it to move backwards if it encounters an obstruction and then return to its working position under its own weight. Developed to meet the needs of modern, large-scale farming operations and contractors, the MF RK 1404 TRC-PRO rake is engineered to deliver optimum performance, making well-formed swaths ahead of high output forage harvesters and large square balers. With a hydraulically adjustable working width from 11.5m to 14m, it is the new flagship in MF RK rake range, offering state-of-the art proCONNECT ISOBUS control, using a compatible tractor terminal or Massey Ferguson’s C1000, 7in touch-screen. Built on a new strong, robust central tubular frame, the rake retains its renowned compact transport dimensions, folding to less than 4m high and 3m wide for transport. Designed for hard work in heavy crops, the rotors are equipped with stronger, maintenance-free arms. Tandem axles on the rear rotors offer excellent ground following, with crop gathering further enhanced by an extra, fifth double tine. ISOBUS control eases operation providing a wide range of functions at the touch of an on-screen button, most of which can be pre-programmed into a control joystick.